Leading Manufacturer of fully automatic cut,strip and crimping machine (csc-2013) from Hyderabad. 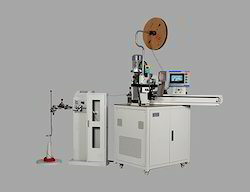 The CSC-2103 is a fully automatic crimping machine for one side termination process. It has design capabilities for maximum speed and flexibility, high precision and quick changeover, and long term durability. Various applications are easily processed as per the requirements. This advanced state-of-the art machine has dynamic servo controlled motors, driver and PLC based controller and is optimized with touch screen. This CSC-2013 helps save and restore the programs upto 500 types for quick product selection to avoid the delay in programme. This machine displays the problems that it is facing and tells you the root cause of the problem too. This will facilitate you to troubleshoot the problem in a quick short time.